Welcome to Tutorly! We aim to make it easy for you to find and connect with a great tutor from our hand-curated lists, but if you'd like our experienced team to take care of it all for you, we offer a Premium Service for a flat fee. Tutors listed on our site are self-employed, so set their own hourly rate. 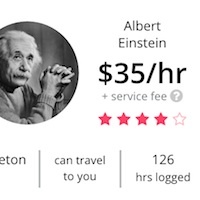 You can easily sort tutors by price, which ranges between $25 to $60 per hour, depending on experience and reputation. If a tutor has to travel a large distance to meet you, they might ask for a small increase to their rate to cover travel costs. As a marketplace, we support independent tutors. This means that tutors receive their full hourly rate, instead of losing a large commission to a traditional agency. Better for them, cheaper for you – and you're able to pay your tutor securely by PayPal, debit or credit card. We add a small service fee to each bill your tutor sends you. This allows us to keep our service running – we actively maintain & curate tutor listings by hand to promote quality, and you can phone our friendly team at any time if you need help. This will quickly return you with tutors that specialise in what you’re after. For example, instead of searching just for 'maths', you could try 'maths IGCSE' if you’re wanting help with the first year of maths in the Cambridge International Examinations. A Tutor Search will consider tutors within ~10 km (~6 miles) of your suburb. 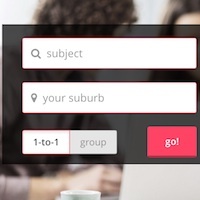 This means you'll only be shown local tutors that can help you in-person. Alternatively, you can browse all tutors in your city. Tutors are frequently rated and reviewed by their current students on three criteria: knowledge, teaching ability, and reliability. You’ll see the average of their most recent 10 ratings displayed on their full profile, as well as any reviews they’ve received. 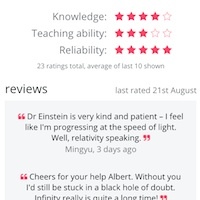 This information, along with their self-description and log of hours spent tutoring, will help you judge a tutor’s suitability. Also, you (or your child) may learn best in a particular language. Have a look at a tutor’s profile to see what languages they’re fluent in. To message a tutor, simply click their 'contact' button – you don't need to sign up for an account or anything like that. Tutors will email or ring you in reply. The ideal message to a tutor includes the subject curriculum you'd like help with, year of study, what day and time of the week you’d prefer for lessons, etc. This key info allows the tutor to quickly determine if they can help you. Once you're talking with a tutor, be sure to discuss your goals. For example, do you want a confidence boost in a particular subject? Help with exam preparation? Aid with catching up on missed classes? This will help your tutor prepare the most effective lessons. The best tutors are also the busiest; it may be that they’re unavailable at your preferred day or time. Because of this, we recommend that you contact at least three tutors to start with. This will increase your chances of finding a suitable tutor who fits in with your schedule. Your tutor will send you bills directly via email, at a frequency that you agree with them. You won't need cash – our online payment system is run securely by PayPal, and accepts credit or debit cards at no extra cost. 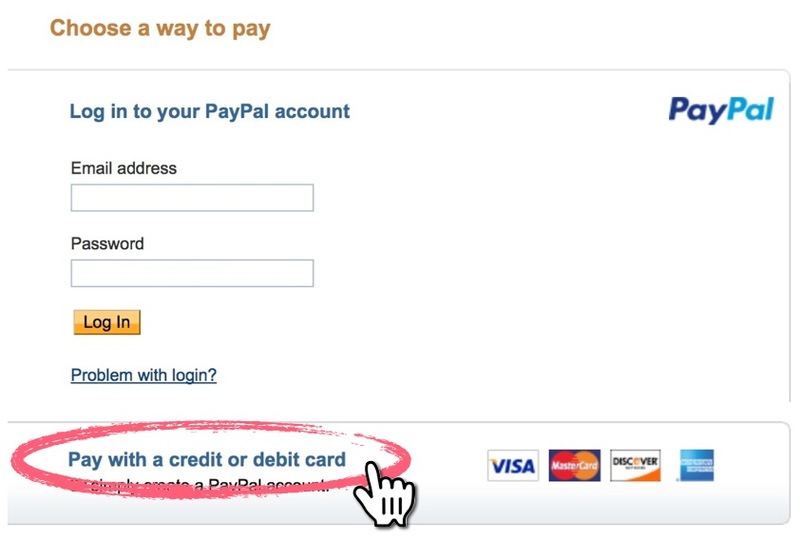 If you don't have a PayPal account, simply select 'pay with a credit or debit card'. For further payment help, see our FAQs. Please do not pay your tutor with cash or bank transfer. If you do this, they will not be able to log the hours, ratings and reviews needed to build and maintain their reputation on this website. Not to mention that it's also how we receive our service fee! Most tutors will typically send a bill after several lessons. If a tutor would like to bill you in advance of lessons, please make sure you are comfortable with their cancellation policy. How long is a typical lesson, and how often should tutorials occur? Most sessions run for 1 to 1.5 hours, and take place once a week. It’s completely up to you, however – perhaps start with a weekly tutorial and see how you go. As exams get close, or during school holidays, you may want lessons to occur more frequently. Where should lessons take place? It’s common for tutorials to occur in your home. That’s part of the attraction of hiring a personal tutor - they can come to you! Make a quiet part of your home available as a lesson space, and do try to have other family members within earshot during tutorials. If your home is distant from the tutor, mutually convenient public venues like a café or library are a great alternative option for tutorials. Lastly, if the tutor hosts lessons from their own home, make sure you’re completely comfortable with the arrangement. Perhaps ask to speak with one of their current students (or parent) for a reference. For more safety recommendations, see our section on safe tutorials. Once you and a tutor have agreed to work together, make sure they email you their cancellation policy. A typical cancellation policy is for there to be no charge if you cancel a lesson at least 12 hours in advance; a 50% charge if cancelled within 12 hours; and a 100% charge if cancelled within 1 hour of the lesson start time (or don’t show up to the tutorial). Tutors usually understand if something happens outside of your control, but it’s always good to know what your obligations are from the outset. Lastly, if you’d like your tutor to bring evidence of their qualifications and/or background check to your first lesson, let them know. Your tutor will be three-parts teacher, one-part inspirational coach, so it’s important that you (or your child) get along well with them. Use your first session to test this chemistry. To begin, your tutor will most likely ask a number of questions to better assess what to focus on. They'll come up with a plan, and then make a start on a topic. After the lesson, let your tutor know you’ll have a think about whether or not you want to proceed with future tutorials. The tutor shouldn’t pressure you to make a decision on the spot, but do get back in touch with them as soon as possible. Remember, all tutors offer a First Lesson Guarantee – if you’re not satisfied with your first lesson, for whatever reason, they won’t charge you. If you’re happy with your first lesson, organise some future tutorial times with your tutor. If you’re unsure of your exact schedule, just pencil in the next one or two sessions and go from there. Briefly discuss with a tutor how often they’ll bill you – typically it’ll be weekly or fortnightly. They’ll email you each invoice, which you can pay online by debit or credit card. Do let a tutor know ASAP if you need to rearrange or cancel a lesson. Make sure you’re aware of the tutor’s cancellation policy, just in case! Each time you pay a bill, you’ll be invited to rate your tutor on three factors: knowledge, teaching ability, and reliability. A tutor’s most recent ratings form the largest part of their reputation, so it’s important that you give honest feedback. Your input helps other parents & students make the best possible tutor choice.